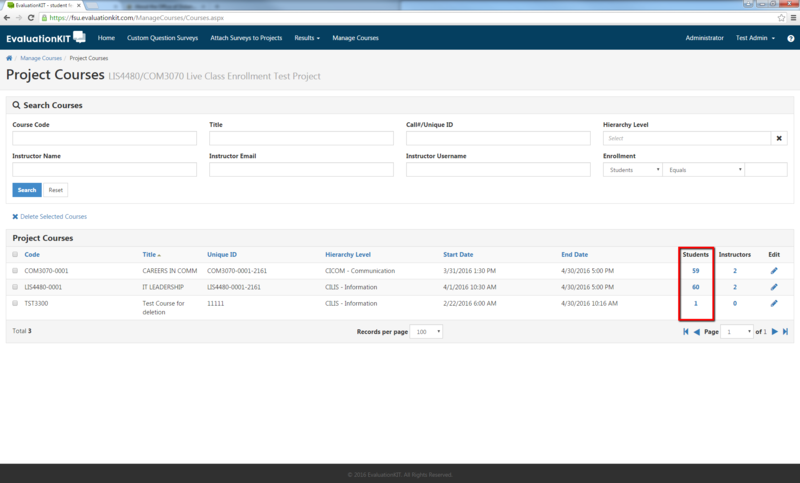 The following steps will assist you with managing your enrollments for EvaluationKIT. Instructors, you can change survey start and end dates and add instructors or students as well as contact your departmental evaluation administrator to opt out of having your course evaluated. Note: Your FSUID and password will be required to login. 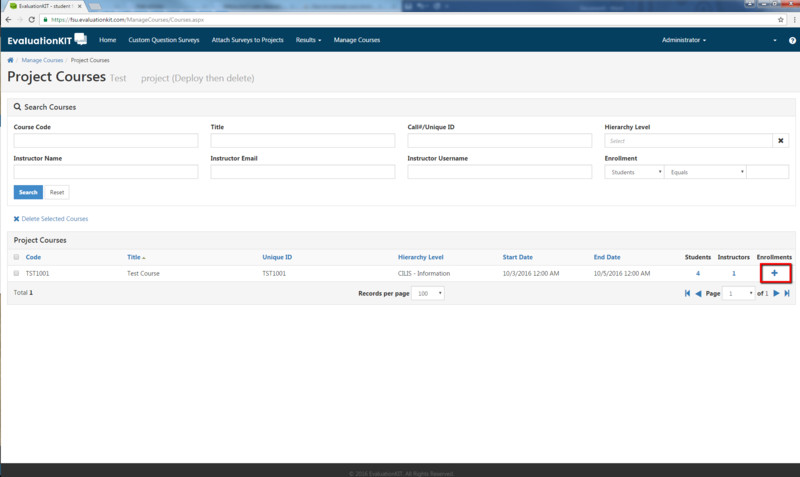 Note: There may be slight variations in the layout of this page depending on how your EvaluationKIT administrator has configured your project widgets. Step 1: Click the Manage Courses link at the top of your screen. 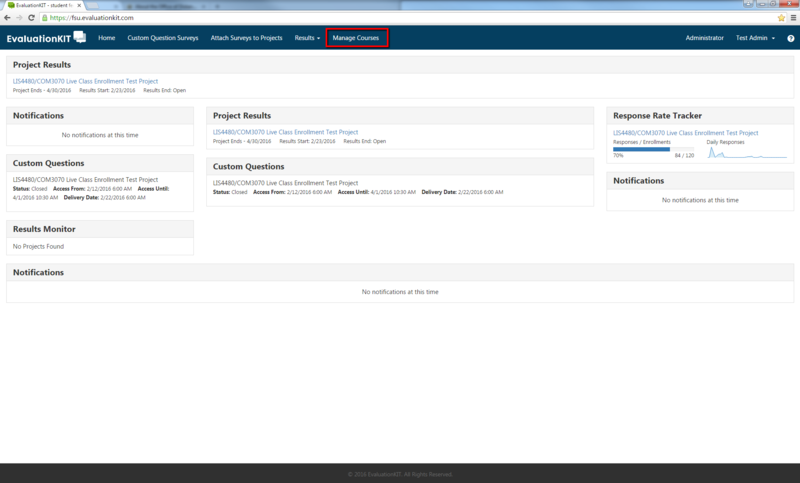 Step 2: Select the Project that is associated with the current semester by clicking the magnifying glass under View. This will display the semester you wish to check enrollments for. 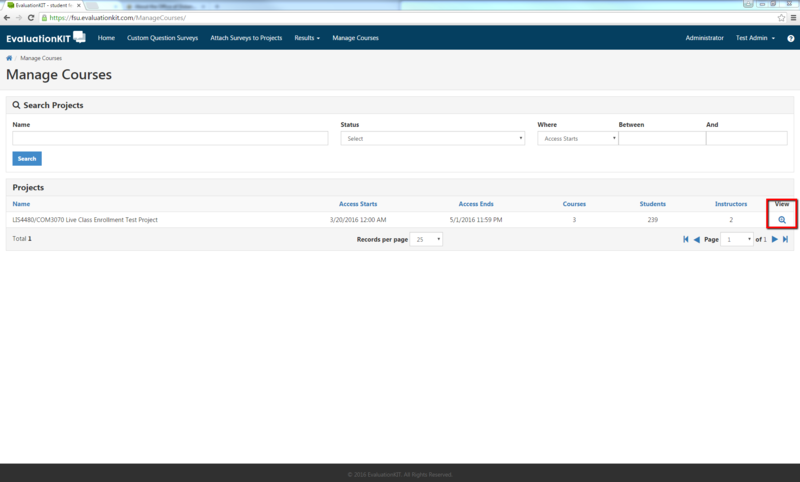 Step 3: Select the course you wish to manage enrollment for by clicking on the number under Students. 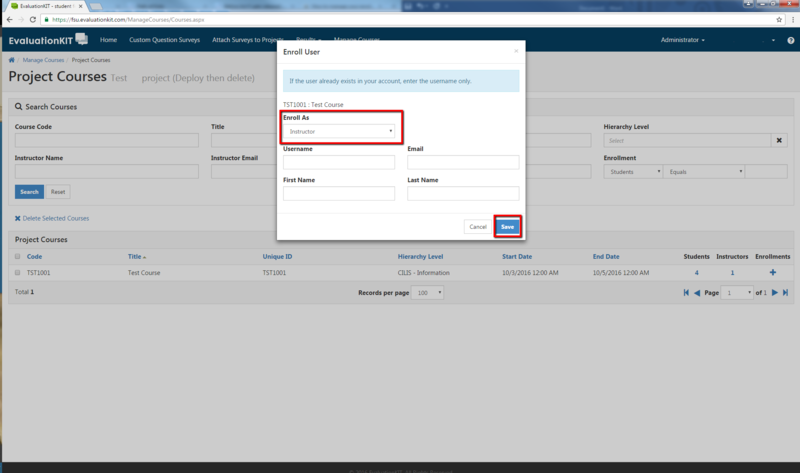 Step 4: Using the window that pops up, check or delete enrollments as needed using the check boxes next to student names and the Unenroll Selected Users button. 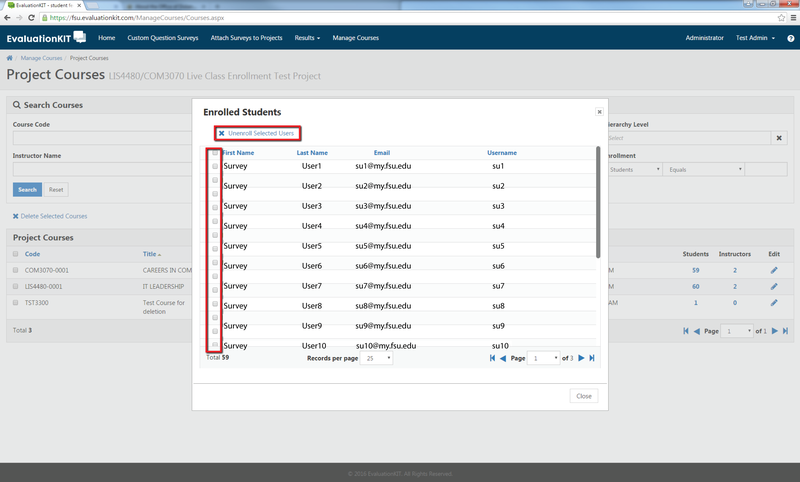 Departmental administrators who need to enroll students or instructors can do so using the enrollments + symbol next to a course. To add a student or instructor simply enter the user’s information in the applicable areas using the pop-up Enroll User window. Once user details have been entered click save. Note: Be sure you have selected the appropriate roll for the user using the Enroll As drop down menu. From the Manage Courses page, navigate to the course you wish to remove from being evaluated by using the search criteria at the top of the page. After locating the correct course you can use the check boxes and the Delete Selected Courses to completely remove a course from being evaluated. Note: Please be sure that you are deleting the correct course. There is no way to undo a deletion. If you wish to have the course evaluated, but not have the evaluation associated with an instructor you can do so by selecting the instructor of the desired course by clicking on the number on the right side of the screen under the Instructors column. You can then use the check boxes and the Un-enroll Selected Users button to remove an instructor from the chosen course. This will allow students to answer the relevant SPCI questions about the course, but will remove any listed instructor name. If you need to make changes to the start and end date for course level surveys you can do so by making use of the edit button when viewing courses for a current project. Please exercise caution when making changes to these dates as they can directly affect scheduled emails for all enrolled users and departmental administrators. At the bottom of the "Edit Course" page you can use the calendar pop up in the Survey Access Start and End date boxes to select the date you would like your survey to be available to students. 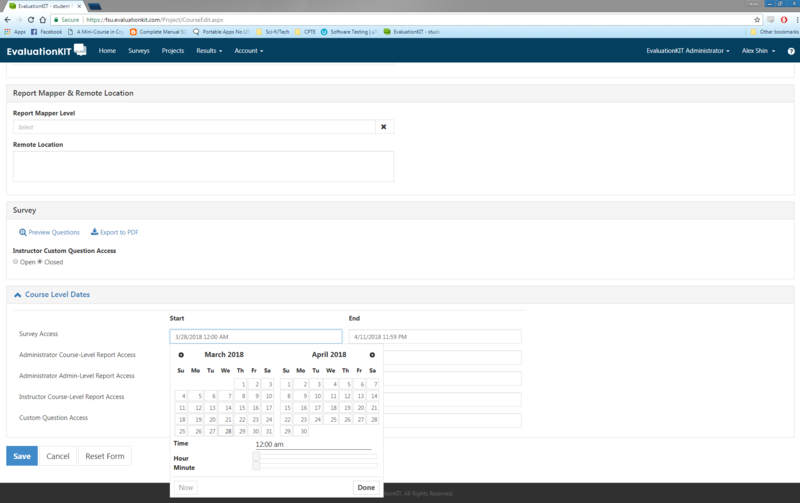 After you have made the desired changes, use the save button to return to the courses page.